Oprah says she wants Palin on her show. (CNN) - Did Sarah Palin snub Oprah Winfrey? That's what the most popular daytime talk show host and fervent Barack Obama supporter appeared to suggest in a recent interview with the entertainment show Extra. Winfrey’s comments came in response to rumors she refused to invite the former vice presidential candidate on her popular daytime show. Earlier this week, the talk show host announced she will tape her inauguration week show in the nation’s capital, and has rented the Kennedy Center’s lush Opera House – which seats roughly 2,300 — to serve as her studio. Sometimes I read some of the opinions and comments developed by our viewers and it disgusts me to the maximum that people are bitter over a women who has done nothing to harm them or their families. People, get a life. Oprah – GET A L I F E!!!! 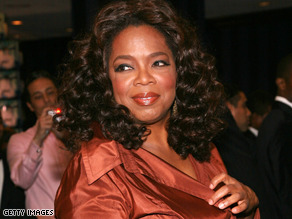 Why y'all hatin' on Oprah for being fat? Most of you Americans are fat. "I've been a Baptist Christian all my life and I must say……..these holier-than-thou, hypocritical, right-wing, nutballs are what's wrong with this country. NO ONE knows for certain what the afterlife will bring…it's a BELIEF! We believe in our God, the same way, Jews, Muslims, Buddhists, Hindus, etc. believe in theirs! " If this is what you believe Angie you are a Baptist only in the sense that you were raised by Baptists, and perhaps go to a Baptist Church, but you certainly have NO FAITH and NO SALVATION. There can be only one truth and that is found in the Bible, and if you were a TRUE believer the Holy Spirit would have confirmed God's word in your heart and you would know this. I pray you read your Bible and discover true Salvation through Jesus Christ. Oprah – you are too good for Palin. She needs to grow some brains before she seats on your coach. don't worry about her – Alaskans are tired of waiting for Palin to do her job as Governor and stop playing Hollywood. Wait one second, WHOS SARAH PALIN???? Ahhh Oprah – The most Racist person in the US other than maybe Bill Cosby. Your show is old news – not anything that someone would make time for out of their busy schedule. Ms. Palin has to get ready to start taking up the slack for the new Unqualified President Elect. Sarah should go on Oprah's show just as soon as Obama goes on Rush Limbaugh. Funny thing is that Obama would get the fairer shake. And those of you who think that it's only the media that's interested in Sarah Palin are either delusional or in serious denial. And won't you be shocked in 2012 or 2016?